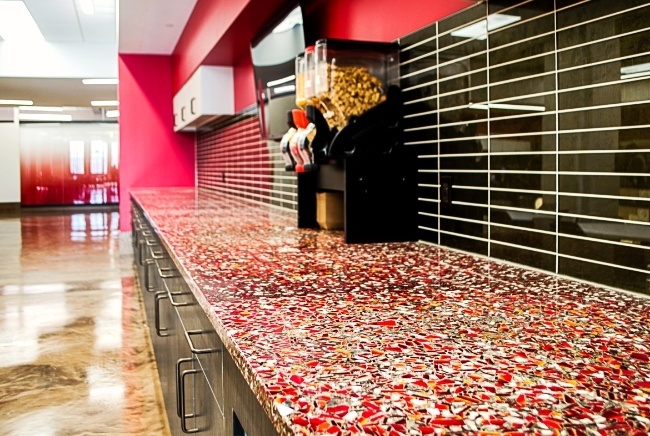 Recently they’ve been opening many new locations throughout the US and have been including Vetrazzo recycled glass countertops in their offices, mother’s rooms and employee kitchens. Their selection of our Vetrazzo Ruby Red reycled glass surfaces for this Washington D.C. conference table wasn’t just for the token red color of the Quicken brand, but also for the 600 lbs of recycled glass contained in the slab from decommissioned traffic lenses and post industrial waste glass from the manufacturing process of producing certain types of tableware. The historic Detroit News Building designed by Albert Kahn and built in 1917, is now the home of the new Detroit, MI Quicken Loans offices where 875 employees will occupy a 175,000 sq ft space including 10 training rooms and multiple conference and event rooms. Preserving the elements of the original architecture, this new-meets-old design completed by dPOP! 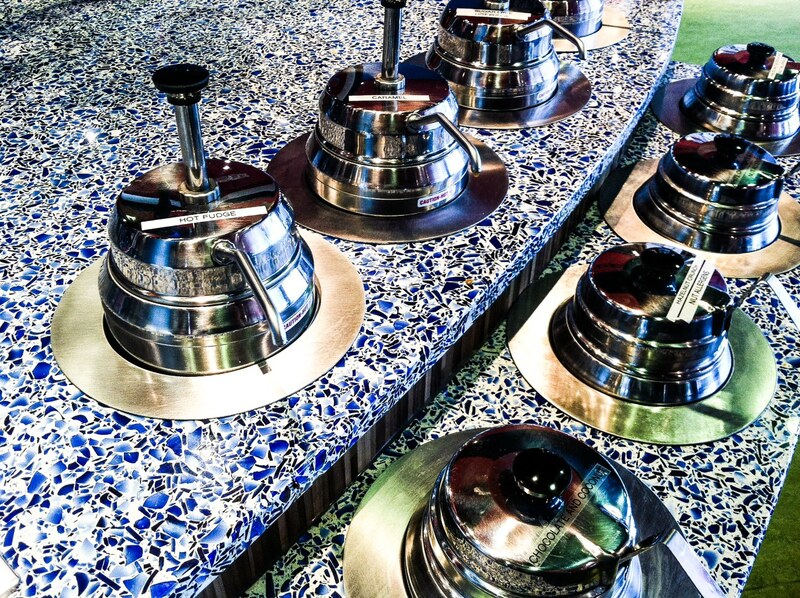 unifies the building’s impressive history with more modern features and amenities. 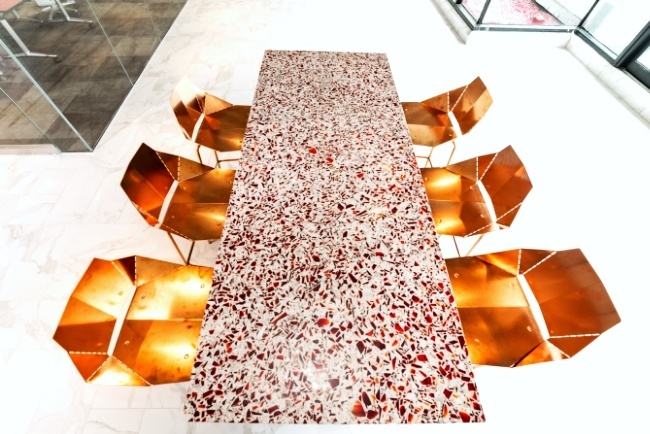 Not only were the aesthetics of Vetrazzo Ruby Red Patina a driving force in the project, so was the durability which was another important factor in the selection process. 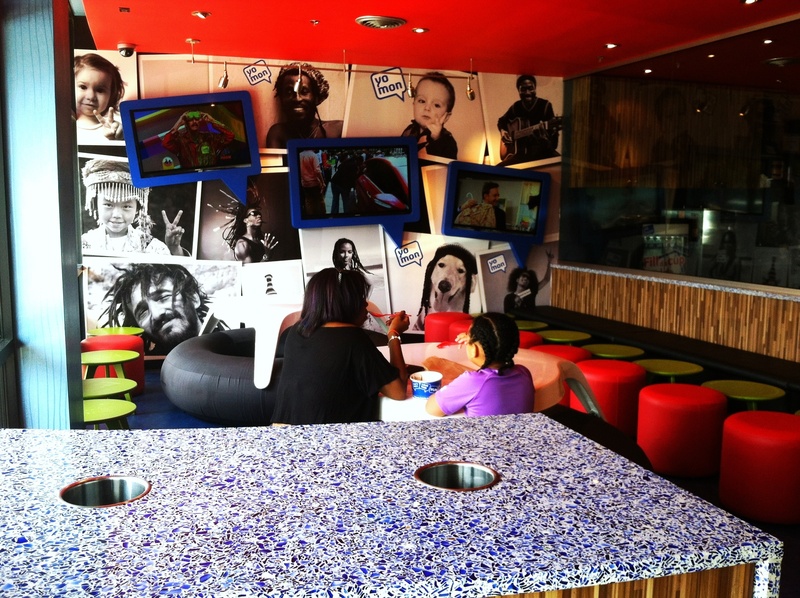 Their team had used the product previously on other projects and knew it not only looks great, but it also performs well. The recently completed Chapman University in Orange, California has staked their own claim on ‪sustainability with the Vetrazzo Cubist Clear recycled glass surfaces they just installed throughout their new Performance Arts building, made from salvaged auto and tempered safety glass. 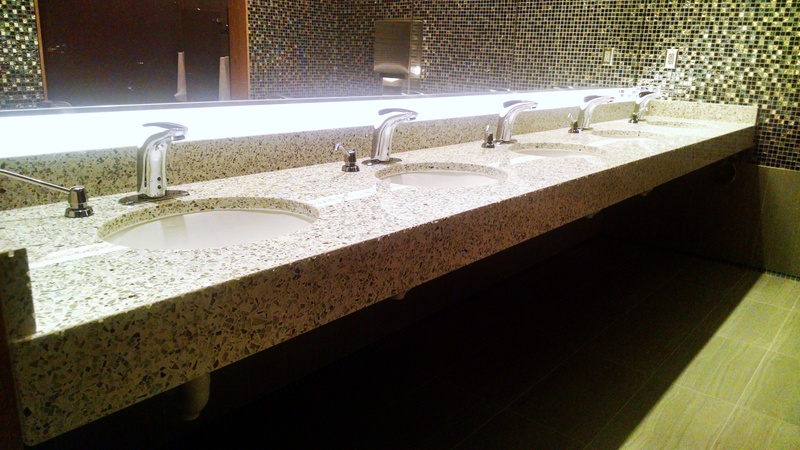 Used for the reception, ticket and concession counters as well as for the restrooms, the overall design of the building incorporates other green building systems with Vetrazzo being the most visible outward expression in the plan. Visited by thousands of people every year, the Auditorium will host performances and top musical acts for the public as well as University staff and students. 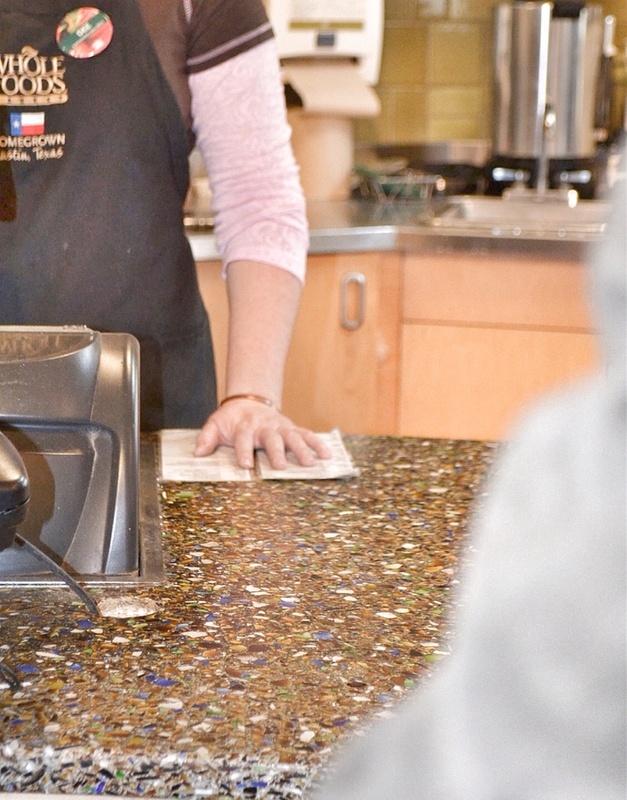 And it’s for this reason that many Whole Foods locations across the US feature our Vetrazzo Charisma Blue Patina recycled glass countertops in their coffee bars and food service areas. And there’s no trade-off when it comes to the aesthetics of the product as the appearance of the recycled beer bottles lends an inner warmth and luminosity due to the white cement binder that reflects light back through the glass particles while the surrounding dark patina finish highlights the effect. So considering that brands are able to evoke positive or negative feelings, especially in the context of sensitive social and ecological issues, the more positive the perceptions and feelings are towards a brand, the more likely they will be to gain loyalty amongst consumers. 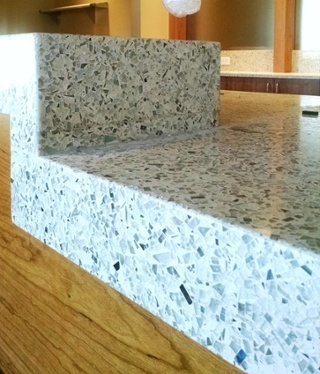 If your business or educational institution is looking to implement some of these changes as well, why not include Vetrazzo’s sustainable recycled glass countertops into the design, it’s an easy and very visible way to make an immediate impact on your business while diverting tons of glass and wasted embodied energy from overcrowing landfills for millions of years to come.